There’s nothing more enticing than the smell of a great meal cooking, is there? Yet, most of us don’t always have the luxury of spending hours in the kitchen creating mouthwatering food and aromas. We’ve pulled together some ideas we’ve found on Pinterest for easy DIY scents you can make in minutes, without having to slave over a hot stove all day! Try these when having friends over to create a special atmosphere, or when your apartment air is stale and needs a quick “pick-me-up.” All you need to create these all-natural scents is a saucepan, a little water and some simple ingredients. Note: Simmering should only be done when you’re at home – never make stovetop scents while you’re away from the apartment. If this scent doesn’t bring back childhood memories of holiday feasts, nothing will! Slice the orange into quarters and place into the pan along with the spices (give the orange sections a little squeeze to release the oils from the skin). Add enough water fully cover the ingredients (about an inch above the top of the orange sections). Turn the heat on low/simmer. Add more water as it evaporates, being sure the pan never goes dry. If you Google “scent in Williams Sonoma,” you’ll find this DIY recipe for the lovely smell lingering through the kitchen goods retail stores. There are variations that call for thyme instead of rosemary and lime instead of lemon; either way it’s a fresh, sophisticated scent that will invigorate your apartment. Put ingredients into a saucepan, cover with water, turn stove on low/simmer and let the scent unfold. Add water as needed. If you don’t want a food-related scent, try this fresh, earthy pine/cedar recipe. For this outdoorsy scent, simply put the pine or cedar greenery into the saucepan along with spices, top with water (like the previous recipes, cover so that the water is about an inch above the ingredients). Turn on low/simmer and replenish water as necessary. Using Your Crockpot Works Too! These recipes can also be done in a crockpot set on low, with all the cautions remaining the same (don’t leave the apartment and keep the water level high enough to cover the ingredients). Pour 8 cups water into your crockpot; add 2 heaping tablespoons of baking soda. Turn the crockpot on low and let it sit without the lid for a few hours, until the smell is gone. Baking soda pulls odor out of the air and neutralizes it, leaving you with a fresher, cleaner-smelling home. Best of all, it won’t cost you a dime (if you already have baking soda). 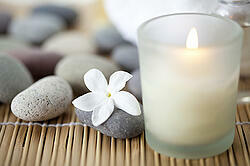 Have any room scent ideas or odor-neutralizing tricks others could benefit from? Our residents are always eager to learn from others, so please feel free to share with us!